The roofs of large structures such as shopping malls, warehouses and office buildings can be as hot as 150 degrees F in the summer, enough to affect whole neighborhoods. Using surfaces with higher albedo for roofing and pavement can reduce the ambient air temperature so that the entire surrounding area benefits. In computer modeling for Los Angeles done by Lawrence Berkeley National Laboratories, the cities "heat sinks" (pockets of heat indicated on infrared satellite imagery) were identified. In a simulation, 15% of those areas were lightened and cooled, using high albedo roofing, concrete or lighter colored paving and shade trees. The result was a 6 degree F reduction in ambient air temperature and a 10% reduction in smog (the equivalent of removing 3-5 million cars from the road). Additionally, it was estimated that these changes would conserve up to 175 million in cooling costs. Actual energy savings for a specific building depend on many variables in addition to the roof's albedo, such as the amount of insulation, geographic location and cost of electricity. The benefits can be dramatic, however, in certain situations, as much as 50% savings in cooling costs and reduction in peak cooling demand by 10 to 15%. 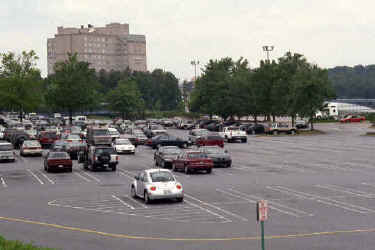 Parking lots are major contributors to urban heat islands. On a summer day, a black asphalt parking lot can reach 195 degrees F. Rain that falls onto a parking lot in the summer can be heated to 90 degrees before running into waterways where it can harm trout and other temperature-sensitive species and dump toxic pollutants carried in the runoff. Parked cars on hot pavement continue to emit gas fumes which contribute to air pollution. While various alternative surfaces with higher albedo are available, the cost, durability, strength and maintenance concerns are often an issue for developers. The strength and durability of porous pavement appear to be equal to traditional materials and it is also less susceptible to freeze-thaw cracking due to the large void spaces. The material's cooler surface and its ability to retain stormwater while improving water quality and enhancing tree and vegetation growth make it an exciting example of green and sustainable building practices.